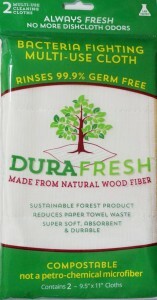 Green Team Distribution would like to welcome our newest product, Durafresh cloths. Durafresh is an effective, bacteria-fighting multi-use cloth that rinses 99.9% germ free under running water, a great way to replace paper towels in your household and reduce your need for chemical cleaners. There is no need to wash these handy cloths in the laundry, however, the cloths can be machine washed if you prefer. Since they rinse clean with just running water you can use and re-use and as long as you rinse them between each use they will be clean, odor free and ready to use for the next mess! A little about how they work. 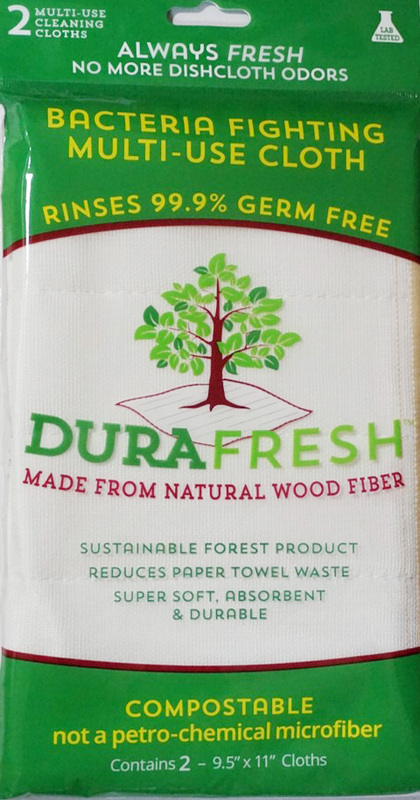 The Durafresh cloths is made from dissolving wood pulp. The dissolving wood pulp is derived from portions of the tree that cannot be used as timber grade and is comprised of various tree species from managed forests. 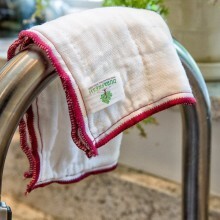 The multi layered open weave design picks up germs on surfaces and rinses 99.9% germ-free under running water; and stays fresh and odor-free, soft, absorbent and stain-resistant. They do not contain any petrochemicals like many microfiber cloths and will biodegrade in compost or can be incinerated without releasing toxins. They are sold in two packs. Just out of the package, begin by rinsing out the natural vegetable starch stiffener in ordinary tap water, or you can machine wash. We recommend air dry or low heat to extend the life of your cloths, and avoid using fabric softener. Rinse out and air dry or wash after each use as desired. The Durafresh cloth will become softer, thicker and more absorbent with repeated use. The cloth lasts for months, replacing dozens of rolls of paper towels, reducing waste, saving money, and storage space. This entry was posted in Blog and tagged chemical free, cleaning, Distribution, durafresh, enter to win, Environmentally friendly, giveaways, green, Green Team Distribution, new products, rafflecopter, reusable, sales, sweepstakes, Wholesale. Bookmark the permalink.